Well, on to book two and it was fun catching up with some of the characters from other series, but overall I was disappointed. 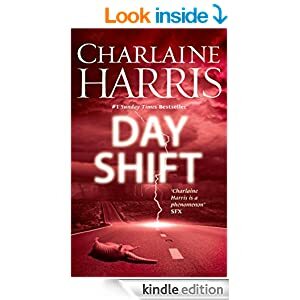 The small town atmosphere is perfect, something Charlaine does so well, and as a UK reader I still felt as if I understood the town and it’s inhabitants. Somehow though there was a lack of real drama. I was disappointed that the Bobo/Fiji romance didn’t go any further – in fact it seemed to have gone backwards, and likewise poor Manfred’s fledgling romance with Creek has gone..well..up the Creek…( ok – groan now!) I didn’t really feel any of the characters progressed further, that I “knew” them any better than from the first book. There’s always things happening in the town, and the renovation of the hotel is a big issue for them. No one knows why, there’s something odd about the old people who are living there temporarily, why were they chosen and who pays? We’re still wondering all that at the end BTW, the who, what and why. Lemuel is out of town trying to find out more about the old books he got from Bobo, the Rev takes on a young lad while his father is away, and the boy has some oddities – he fits in well of course! Mr Snuggly is a star as always – I love that cat and his ways. The main part of the story focuses on poor Manfred, when a client dies unexpectedly in a consultation with him, and her son accuses Manfred of theft of her jewellery. Then it becomes a murder investigation and the town gets filled with lawyers, police and media reporters….and being full of people who do not need closer looks they are all very worried, and try to set things straight as best they can. Its kind of a Miss Marple with supernatural people feel about it, that small town gentility and politeness, where everyone knows so much but reveal little as they are all holding secrets too. I enjoyed it but it didn’t grip me and make me feel I simply had to keep reading. Its an interesting story but to be honest for me it lacked any real depth, and its not one I’d reread. I’m not sure whether to read the final one – and usually in a trilogy I’d be desperate for answers by now but – well, I’m kind of curious what follows and how it ends but that’s all. Stars: Four, but as a one off read not a keeper.